Leah Hughes, assistant editor, shares her mom’s recipe for persimmon pudding. Leah Hughes and her mom, Sharon. Editor’s Note: In celebration of Mother’s Day, Our State staff members are sharing their moms’ favorite recipes. Enjoy! 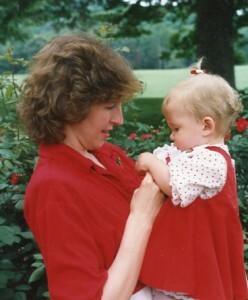 The photo is of Leah and her mom, Sharon, on their first Mother’s Day in 1989. Leah was 9 months old. Mix together wet and dry ingredients. Then add 1 teaspoon vanilla. Pour into 9” X 13” baking dish. Bake at 325º for 1 hour.